Hi Muru in Finland..."best bunny ever!" Happy Pet of the Day! What a beautiful blend of Lionhead and Lop bunny you are, Muru! Your fluffy, grey and white coat, those sparkling blue eyes are gorgeous, and that sweet little face of yours is beyond heart-melting! And not one to stand one your stunning good looks alone, you're also an accomplished athlete, a champion jumper! Wow, how impressive, you clearing that hurdle! How very lucky your family is, Muru, having a friendly and social, sweet and loving, beautiful best furry family member in you! You're just as special as they come, Muru, a gem, and so very deserving of your big day in the spotlight! Thanks for the BIG smiles, Muru! Meeting you today, seeing your heart-melting photos has been a real treat! I hope you're enjoying a very special day of celebration...playing in your garden (weather permitting!) and munching on yummy treats, cuddling with your humans, being loved and pampered to pieces! Lots of love, snuggles and kisses to you, precious Muru, our very special and most deserving Pet of the Day, EVERY day! What a handsome boy you are and can you ever jump. That is the cutest picture. 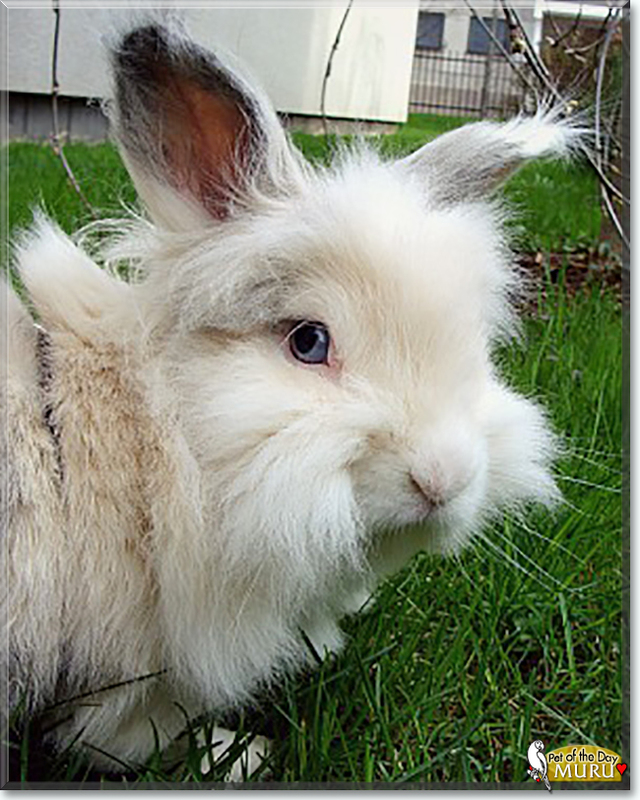 Dearest Muru, what an absolutely adorable Lionhead/Lop mix Rabbit you are! You're so pretty with that fluffy, soft-looking fur and that sweet face with the short ears and those lovely blue eyes. You have the most delightful personality, too, and you make your dear people smile with your antics and energy. 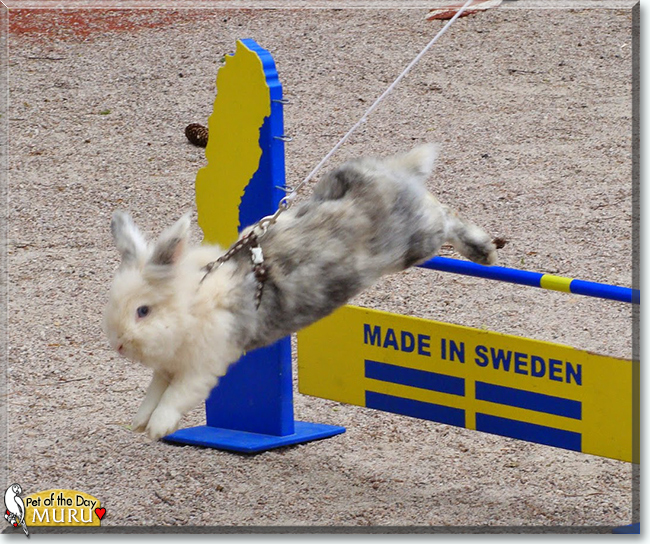 You look like a true champion at rabbit jumping! You and your dear family members all love each other very much, don't you. What a wonderful love-filled home you share! 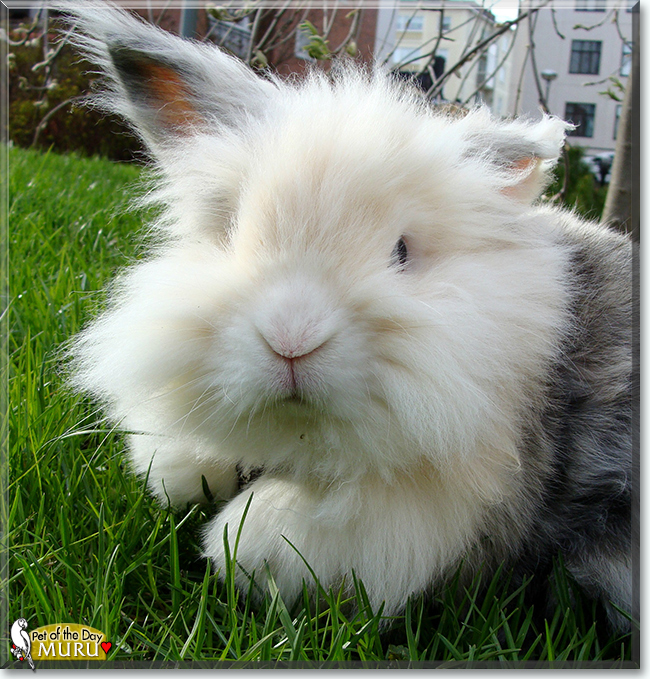 Congratulations, darling Muru, on being chosen today's Pet of the Day! We hope you and all your family and friends are enjoying a fine celebration, full of fun and lovies and all your favorite games and treats. and a great jumper too.